While the winds of change are blowing the fall season in like clockwork, our minds and bodies aren’t always ready for the change in weather or temperature and may end up feeling “a little under the weather” or even a little ungrounded with stress. Believe it or not, connecting with the earth, and taking the time to ground our mind and body is the best thing we can do during the fall season. If we don’t, we may continually suffer through some of the season’s typical symptoms. Are You Suffering From Fall Symptoms? Have you’ve found yourself feeling a bit nervous, anxious, or difficulty focusing? Are your bones and joints feeling a little achy? What about dry or irritated skin, or even ringing in the ears? These are just a few symptoms that signal you might have a little “Vata” imbalance. And that’s where a little self-care, proper diet and an appropriate yoga practice can help balance you from fall’s winds of change. Yoga’s sister science, Ayurveda, which literally means “life science,” associates fall and winter with the term “Vata” which is one of the three Doshas that defines the nature of individuals, foods and herbs, as well as seasons and a number of other things that are studied to keep us in balance with nature – both in mind and body. The nature of Vata is not only linked to the wind and air, but also to things that are cold, dry, rough, brittle, and hard – things we easily relate to the fall and winter seasons. Internally, Vata also relates to our nervous system, as well as movement of joints and bones, ears, skin, and the energy of the thoughts that move through our mind. So if you’re experiencing any of the symptoms mentioned above, try a yoga practice that includes a few grounding asanas, such as Forward Bends, that allow the body and mind to relax, standing poses where you feel balance throughout the body, twists to help cleanse and release toxins from the body, and of course some Pranayama and meditation that also helps to calm and balance both the mind and body. Focus on grounding the legs and feet; also use breath and Uddiyana Bandha to go allow the body to go deeper into the pose to relax the nervous system. Ground the sit bones and, as stated above, use the breath and Bandha to go deeper. Better yet, try a restorative version of this pose using one or two blankets piled on the legs to support the torso while relaxing forward. A wonderfuly grounding seated twist. This posture calms the mind and emotions, stimulates the nervous, reproductive, endocrine and urinary systems. Try using the arms to intensify the revolving action by either binding through the legs or pressing the arms together outside of the knee in Anjali Mudra. With attention to balancing the weight equally with both feet, and finding stillness in the pose by concentrating on the breath while holding the pose. 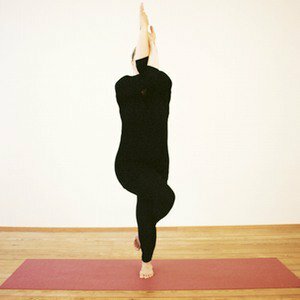 Same benefits as Virabhadrasana, but with a little more balance required in Parivrtta Trikonasana. A balancing pose that wrings out the arms, shoulders, legs and hips with the twisting and crossing action of the body. 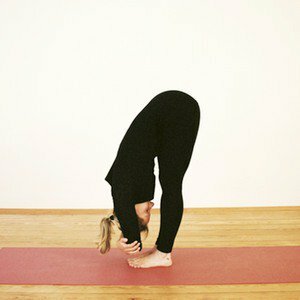 Try adding a forward bend while holding the pose as well. No time for asana? Then just sit and breathe. If you find that the “vata” of the fall season has you moving too much to slow down for a physical yoga practice, try taking a few minutes just to sit and focus on the breath – preferably outdoors where you can feel the elements on your skin. So, as the winds of change blow and affect your body and mind, take some time to stay grounded using yoga as a tool – and you’ll probably find yourself less blown away by seasonal symptoms.